This Is Us season three is over, but you can rest assured that there is more Pearson family drama to look forward to. While the show hasn't officially been renewed yet, the stars and creators have more or less confirmed that they have three more seasons in store. And after what they told Good Housekeeping about season four, we are more than ready! So, just how long do we have to wait until the new season premieres? Not long at all. In the past, This Is Us has premiered in the Fall. 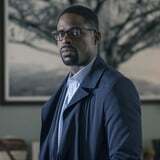 Following the season three finale, Sterling K. Brown confirmed the show would be back in the Fall again when he tweeted, "See you in September, peeps!" It's also likely that the story will pick up as the Big Three celebrate their 39th birthday, just like as past seasons started with their birthday. We are definitely interested to see how Randall, Kate, and Kevin navigate the last year of their 30s.